The tourist attractions in Patan include forts, lakes, temples and Vavs. Apart from these, there are 12 darwaajas that depict the spell-binding architecture of those times. Out of them, Rani ki Vav is the most prominent one that holds tremendous importance as a historical tourist site in Patan town of Gujarat. Rani ki Vav is considered to the oldest and largest step well in Gujarat. The Vav was built during 1022 to 1063 AD by a widowed queen Udayamati who was the wife of King Bhimdev I of Anahilwada, Patan. The Vav was renovated in 1980 that restored its charm to a great extent. The well is built of bricks. It has beautiful pillars. In Rani ki Vav, there is short gateway below the last step of Vav which opens into tunnel as long as about 30 km. This gateway leads to the nearby town of Siddhpur. In ancient times, this passage served to be the escape route for the King at times of defeat. However, today the tunnel has been blocked by mud and stones. 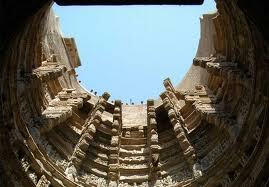 In Vav, there are almost 7 storeys in the step-well which are intricately carved. It is believed that in ancient times, herbal plants of Ayurveda importance grew near the well. These plants possessed medicinal properties and at the same time, they enriched the water with healing powers. The Vav in Patan is not just used for storing and collecting water. It holds a great historical importance. Though the Vav was constructed simple, yet it has become important over the years due to what it reflects, of the ancient era. Every sculpture in Rani ki Vav reflects a lot about the history of kings and queens who ruled Patan. Definitely, the place is a must-visit one in Patan. Rani ki Vav stays open from 8 am to 6 pm every day. Tourists can visit the place during the visiting hours to learn about this amazing site. Indians are required to pay Rs. 5/- as entry fee while foreigners pay $2 for the same.